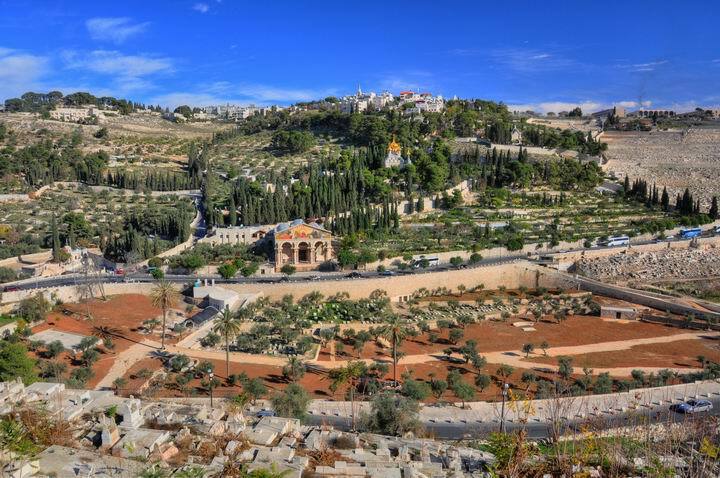 Mount of Olives is the hill facing the old city of Jerusalem, on the eastern side of Kidron creek. It is a Holy place, referred in the Old and New Testaments. It is dominated by a large cemetery on its slopes. 2 Samuel 15: 30: And David went up by the ascent of mount Olivet, and wept as he went up..."
Mount of Olives is the hill facing the old city of Jerusalem, on the eastern side of Kidron valley. Its name came from the olive trees that once grew on its hillside from ancient times. According to Jewish tradition, the Messiah will appear here and bring the dead back to life. Therefore, the hillside became the most holiest cemetery, and the hillside is covered by thousands of grave stones. Jesus had many encounters on Mount of olives, and the area has many Churches that glorify his acts in this part of Jerusalem (for example, see: Basilica of Agony). There are additional Christian sites on Mount of Olives (such as the Tomb of Mary). 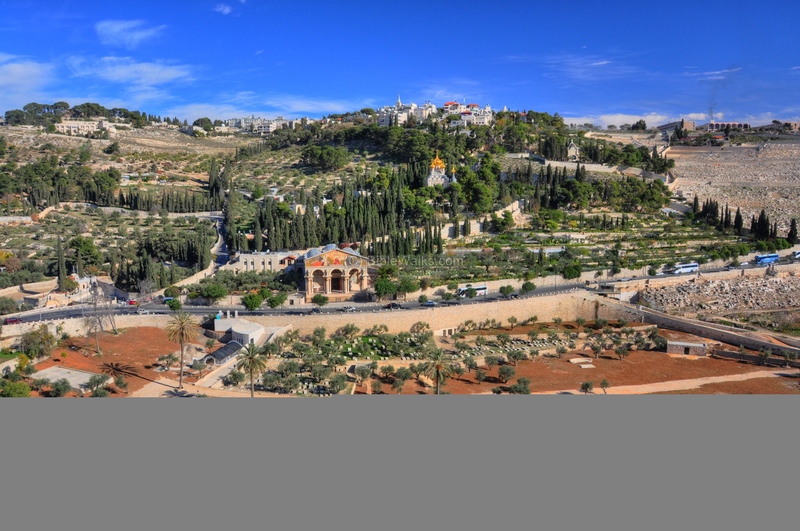 Mount of Olives is located across the Kidron creek, and and its thousands of grave stones cover the entire hillside. On top of the hill is the hotel Seven Arches, once the Intercontinental Hotel. The hill's peak is 830M above sea level, 100M above the old city. The hill north to it is Mount Scopus, the base of the Romans during the siege on Jerusalem, and the site of the first place of the Hebrew University. The hill is first referred in the Bible when King David flees the city (2 Samuel 15: 30, see references). King Solomon erected altars on the hill dedicated to false alien gods. They were later destroyed by King Josiah who "filled it with bones" to prevent future worships. Prophet Zechariah talks about the day of Judgment, with Mount of Olives its epicenter of God's fiery fight against the enemies of Jerusalem. Mount of Olives is associated with acts in the life of Jesus. Several churches mark these places: Pater Noster church, the place where according to tradition Jesus taught his disciples the Lords prayer; the tear-shaped church of Dominus Flevit ("the Lord wept") where Jesus wept over the future destruction of the city; Gethsemane (Gat Shemanim) where Jesus was betrayed and arrested. Until the 12th C AD the Jews used to come and pray from the top of mount of olives, since it has a great view of the temple Mount. During Sukkoth (Tabernacles - a Jewish religious festival) they conducted parades on the hillside. A view of the western slopes of Mount Olives is shown below, as seen from the top of the Golden gate. The valley of Jehoshaphat (Kidron brook) is in the front. Above the valley, in the center, is the Basilica of Agony (with the triple arched facade). To its left is Mary's tomb and to is right is the golden domes of the Russian church - St Mary Magdalena. Further to the right, close to the vast cemetery, is Dominus Flevit church, shaped as a tear drop, where according to tradition is the place where Jesus wept over the fate of Jerusalem. The Chapel of Ascension is located on the top of the hill. On the right side is the vast Jewish cemetery. Note: This photo is not for sale. A view from the Lions' gate is seen below. In the lower center side is the Basilica of Agony, Mary's tomb. On a higher slope is the Russian Monastery. On the top of Mount of Olives, near the seven Arches hotel, is a remarkable vista point. The great panorama of the city and the hillside, covered by thousands of graves, makes it a popular viewing spot. The camel ride has been a famous landmark of this balcony for many years. The terrace is dedicated to Rehavam (Gandhi) Zeevi, the tourism minister who was assassinated on Oct 2001 on Mount Scopus nearby. The view below is towards the north-east side of the old city, with the small tear-shaped Dominus Flevit in the center and behind it is the Russian Monastery. A closer view of the vast Jewish cemetery and the old city in the background is seen below. A remarkable view of the old city is seen in the following photo. This view is seen from a small parking lot just above Mary's tomb, much closer to the Kidron valley. The temple mount and the old city's eastern walls stretch from left to right. "And David went up by the ascent of mount Olivet, and wept as he went up, and had his head covered, and he went barefoot: and all the people that was with him covered every man his head, and they went up, weeping as they went up". The prophet talks about the destruction of Jerusalem, and God fighting the battle against the enemies. Furthermore, the prophet describes that an earthquake will split Mount of Olives to 2 parts, south and north, and describes the horrors of that day which will be recognized as God's acts, but will be followed by a salvation. "Behold, the day of the LORD cometh, and thy spoil shall be divided in the midst of thee. For I will gather all nations against Jerusalem to battle; and the city shall be taken, and the houses rifled, and the women ravished; and half of the city shall go forth into captivity, and the residue of the people shall not be cut off from the city. Then shall the LORD go forth, and fight against those nations, as when he fought in the day of battle. And his feet shall stand in that day upon the mount of Olives, which is before Jerusalem on the east, and the mount of Olives shall cleave in the midst thereof toward the east and toward the west, and there shall be a very great valley; and half of the mountain shall remove toward the north, and half of it toward the south. And ye shall flee to the valley of the mountains; for the valley of the mountains shall reach unto Azal: yea, ye shall flee, like as ye fled from before the earthquake in the days of Uzziah king of Judah: and the LORD my God shall come, and all the saints with thee. And it shall come to pass in that day, that the light shall not be clear, nor dark: But it shall be one day which shall be known to the LORD, not day, nor night: but it shall come to pass, that at evening time it shall be light. And it shall be in that day, that living waters shall go out from Jerusalem; half of them toward the former sea, and half of them toward the hinder sea: in summer and in winter shall it be. And the LORD shall be king over all the earth: in that day shall there be one LORD, and his name one. All the land shall be turned as a plain from Geba to Rimmon south of Jerusalem: and it shall be lifted up, and inhabited in her place, from Benjamin's gate unto the place of the first gate, unto the corner gate, and from the tower of Hananeel unto the king's wine presses. And men shall dwell in it, and there shall be no more utter destruction; but Jerusalem shall be safely inhabited". In this text King Solomon (968-928 BC) builds altars for alien worship, and although it does not explicitly name the hill, the place is probably Mount of Olives. "For Solomon went after Ashtoreth the goddess of the Zidonians, and after Milcom the abomination of the Ammonites. And Solomon did evil in the sight of the LORD, and went not fully after the LORD, as did David his father. Then did Solomon build an high place for Chemosh, the abomination of Moab, in the hill that is before Jerusalem, and for Molech, the abomination of the children of Ammon". This made God furious, and was the reason that God split the Kingdom to two (928 BC) following Solomon's death. King Josiah, many years later (630 BC), destroyed these altars. 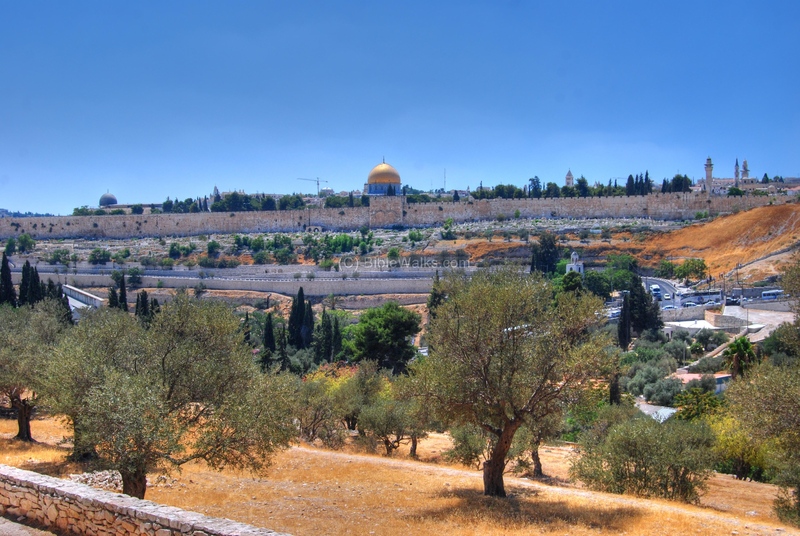 The Mount of Olives is called "the mount of corruption" which sounds similar in Hebrew (Mischah, Maschit). Note that this text explains the cemetery on mount of Olives as the result of the Josiah attempt to fill it with bones, so the place will not be Holy and suitable for worship. "And the altars that were on the top of the upper chamber of Ahaz, which the kings of Judah had made, and the altars which Manasseh had made in the two courts of the house of the LORD, did the king beat down, and brake them down from thence, and cast the dust of them into the brook Kidron. And the high places that were before Jerusalem, which were on the right hand of the mount of corruption, which Solomon the king of Israel had builded for Ashtoreth the abomination of the Zidonians, and for Chemosh the abomination of the Moabites, and for Milcom the abomination of the children of Ammon, did the king defile. And he brake in pieces the images and cut down the groves, and filled their places with the bones of men.". Jesus Arrives in Jerusalem for the feast of Tabernacles (Sukkoth), and passed through Mount of Olives. "Jesus went unto the mount of Olives. And early in the morning he came again into the temple, and all the people came unto him; and he sat down, and taught them". 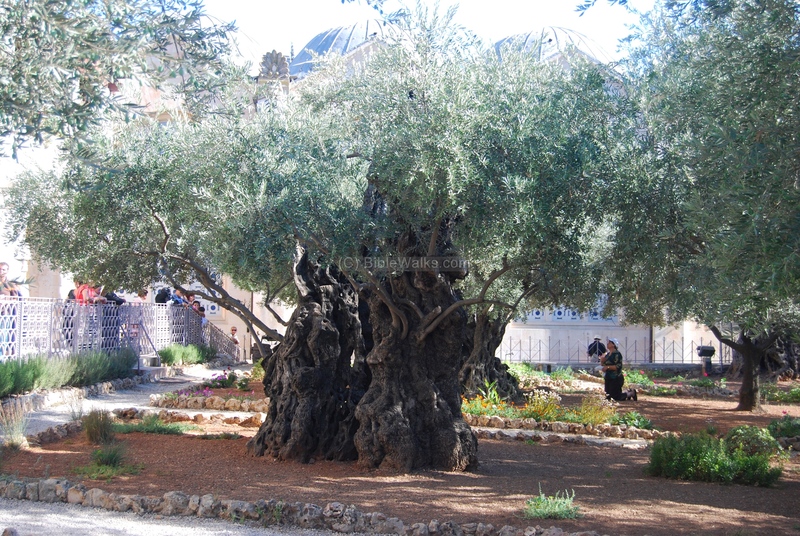 At the foot of the Mt Olives lies the Garden of Gethsemane, where Jesus prayed on the night of his betrayal. 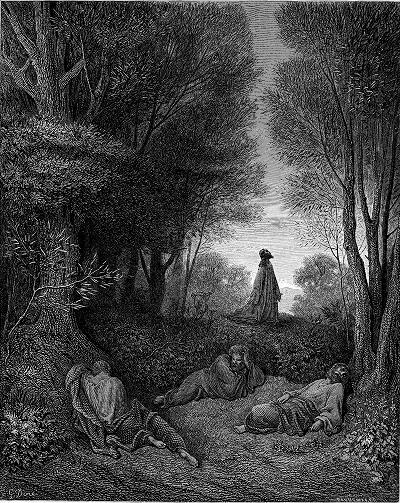 This scene is illustrated in many old paintings, such as Gustav Dore's drawing on the right. "Then cometh Jesus with them unto a place called Gethsemane, and saith unto the disciples, Sit ye here, while I go and pray yonder". "And they came to a place which was named Gethsemane: and he saith to his disciples, Sit ye here, while I shall pray". In the north side of the church of Agony, at the western foothills of Mt Olives, is a garden with several ancient and large olive trees. Perhaps they are the descendents from the original olive trees from the times of Jesus. Gethsemane - Greek: of the Hebrew phrase for "oil press" (Gat Shemanim).